Now this game desperately needed Freeplay! I really got sick of coining this one up and I really hated missing out on the attract mode. 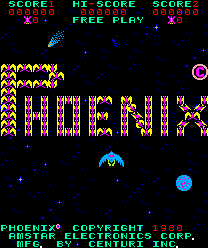 The Phoenix hack was pretty straight-forward and and after a lot of pushing and squeezing, I was able to limit the swap to just two ROMs. I did make both a Centuri version and Amstar version (shown right), so be sure to check the copyright notice during attract mode so that you order the right one for your machine! The versions are not interchangeable, so if you order the wrong version, it will not work. Use DIPS (DIP SW 7) to control whether Freeplay is enabled.